Serenity, nature, and ample amenities are all nestled in the Lexington neighborhood of the Twin Creeks master-planned community. Extensive landscaping enhances curb appeal for an outstanding first impression. 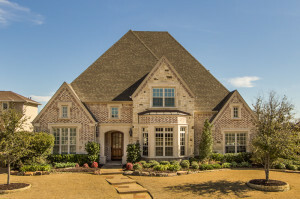 With this Sanders custom home, all it takes is a glance across the back yard to find the Twin Creeks Golf Course, an Arnold Palmer Signature Course. Intimate dinners can be enjoyed in the formal dining room, and the grand island is the focal point of the kitchen where guests can congregate while a meal is prepared. The chef’s kitchen boasts commercial appliances including a Wolf 6-burner gas cook top, dual ovens, and a 48-inch Sub-Zero refrigerator. The open living room with hand-scraped oak floors and wood-burning fireplace can seat many, and the view of the golf course can’t be beat. The luxurious downstairs master retreat overlooks the lush back yard and golf course. By the way, did you know waking up in the morning is a lot more pleasant when you can brew a cup of coffee in your private wet bar just steps from bed? Relax and savor every sip as you prepare for the day in the spacious master bath with dual vanities, jetted tub, and separate shower. Entertaining continues on the second floor in the game room with adjacent wet bar and media room for watching movies or television. Guests and family can sleep in peace in one of multiple bedrooms, each with a private bath. The tree-lined golf course view is a glorious sight to behold, either from the second floor balcony or while enjoying a calm evening on the covered back porch. Zoned to Exemplary Evans Elementary, this is a classically elegant custom home for the most discerning buyer. 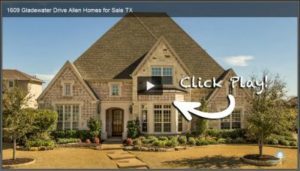 Click here to see all homes for sale in Twin Creeks Allen Texas. What to schedule a private showing or need more information? Contact us at 214-227-6626. « You Missed Your Chance to Steal!